There are a lot of language learning apps available, but it can be difficult to find one that gives you the lessons and detail you need to really become fluent. It’s even more difficult to find one that is free and does all that. That’s where Duolingo comes into play. Originally designed for native English speakers, the app has been updated to reach a much wider audience. It is for anyone who would like to learn a language in a way that both engages them and helps them feel like they are making progress. When you first sign up for the app, it is all of the basic stuff that you are accustomed to doing when you begin to use an app. Basic user information (user name, password, email), the language you would like to learn, and your goal. The app is broken down into easy to digest modules. Each module focuses on a particular element of that language, such as basic phrases, food, animals, and pronouns. The program has already decided in which order you should learn each element of the language. You cannot skip ahead of what’s available, but you can see what is coming up once you finish with your available lessons. If you already have a basic understanding of a language, you can place out of these modules too. This is done through the button to the right called test out. Feel free to brush up on the language by running through the lessons, or dive right into the test. The choice is yours. Learning a language requires you to think in different ways (at least if you want to become fluent). To ensure you get the right mix, Duolingo has a range of activities to keep your brain working and focused. The following are the primary types of lessons you will encounter. Translation in which you will see and hear a word or phrase in the language you are learning and you will provide the English translation (or vice versa). Matching exercises are great for helping you remember exactly what one word means when your mind has crammed too much information. Images make it easier to form an association with the word you are learning. Grammar is an essential part of learning a language. Don’t worry, Duolingo does it in a way that is less intrusive and more intuitive. Speech bubbles explain why the language works in a way that you may not expect. Listening exercises will help you develop the ear you need to understand what is being said. There is also a speaking component to help you learn to properly articulate, although you can turn this off if you would rather not talk while on a train or out in public. When you are learning another language, you probably want to focus on the things that you do well. It’s natural, but not helpful. Duolingo goes in and takes you out of your comfort zone by working on the areas where you are weakest. This happens once you finish a module lesson. The app displays the words that you missed the most often and focuses on them. If you don’t feel like doing it right off the bat, you can always return later to strengthen your vocabulary. Once you improve, the app will give you a gold icon to let you know that you succeeded in strengthening your weakest vocabulary words and skills. You are free to repeat the entire lesson if you want a refresher or just want to really know the section. You can always see how well you’ve done by checking the status bar below the lesson. It shows how well you remember what you have learned. The longer you go between lessons, the lower the bar will be – a good reminder to keep learning so that you do not lose the vocabulary you’ve been building. 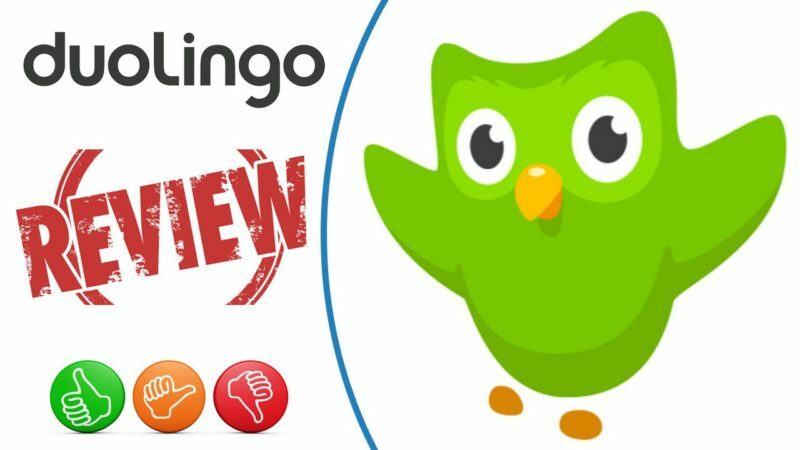 There are a lot of great things about Duolingo, but here are the areas where it really shines as a language learning app. If you aren’t motivated, you are not going to keep learning. The makers of Duolingo recognize this and make sure you feel like keeping up with your work. Having goals is the best way to stay motivated, and that is why you should establish one. If you don’t do it in the beginning, you can do so at any time. In addition to easily displaying how you are doing toward reaching your goal, it provides a tracker that shows what you have learned. It is incredibly easy to see how you have progressed over the course of a week. You can also check out bonus skills using lingots, which you earn for completing secions. Choose from several different options so that you can have something a little out of the ordinary. Buy one of these with your lingots to keep trying new things with what you have learned. Make sure to scroll all the way to the bottom because there are some very entertaining options if you save up, such as idioms and flirting phrases. From the day you start using the program, you will be forming sentences (sure, they will be very basic, but it’s still obvious progress). This can be through filling in the blank using multiple choice or typing it out. Duolingo is very heavy on visual reminders. You can quickly see where you are and what you need to work on to improve your skills. It also uses spaced repetition (periodically repeating words you have learned) to ensure that you remember them – even after you have moved on. The app will tell you when it is time to revisit a particular lesson or set of vocabulary words. The app is very easy to use because it is so clear. The app does not clutter the different screens with information you don’t need. Each part of the lesson, test, and even the store makes it easy to tell where you are, where you are going, and where you want to focus. The app is fantastic, but not perfect. The following are a few things that could be changed to make the experience even better. If you do not spell something correctly (or are more than one letter off) or if you do not pronounce something properly, it will be counted wrong. There is a little wiggle room for one typo, but more than that and it assumes you are wrong. This isn’t necessarily a bad thing. You just need to be warned that you will have to learn the little things too (just like you did when you learned English). Sometimes you will encounter something that is just strange. One of the ones that caused me pause early on was a phrase that translated to “The bear drinks beer.” Yes, the whole phrase contained words I had learned, but the image really threw me off because, well, you imagine a bear drinking beer. It is quite a distracting image. However, it is also to be expected. When you don’t have much of a vocabulary, Duolingo has to work with what you do know. This could cause some pretty strange sentences. This one kind of ties into the previous area for improvement – sometimes the words and the lesson aren’t exactly related. Some of the words are not the kinds of words you think you are going to use. How often do you expect to be talking about mice in French? By the time it happens, you will have forgotten what you learned because, well, it’s not exactly relevant. Perhaps the biggest area for growth in the app is in socializing – Duloingo doesn’t have any. Many apps have a way to talk to others in the language. Again, this is not necessarily a bad thing. When you begin to learn a language, talking to someone may seem like more of a burden than a blessing. At some point you will need to actually talk, but there are plenty of options once you are ready. Sure, there are a few flaws, but nothing major. Duolingo is a great way to learn in the time you have available. From seeing your progress to being able to work on your weaknesses, you will be able to feel more comfortable as you progress because you are actually getting somewhere.